Good morning. My assignment as Father has told you is to present the history of our church. I have broken down my report in two parts. In the initial part I shall discuss what I learned from the archives maintained at our rectory. For that information I am indebted to Diane Snyder, whom I refer to as the parish CEO, who has been with us for the past 24 years, for the information she made available to me from our church archives upon my request. The second part consists of my personal knowledge and recollections supported by my wife, Rose Marie, and our children. 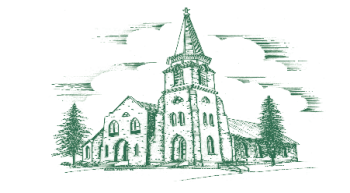 For the past 58 years Rose Marie and I have had the good fortune to be members of this parish. Both of us are pleased and proud to have this opportunity. 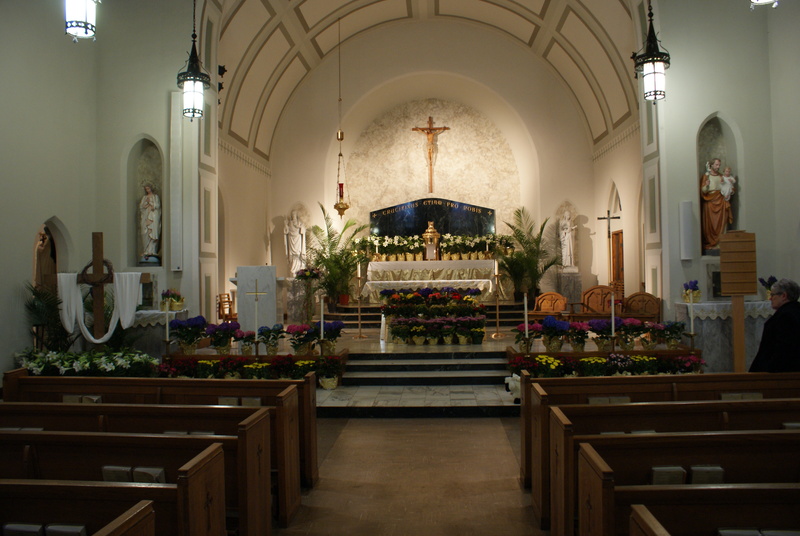 Now from the archives, as early as 1831, the first mass was said in a catholic church setting by Father O’Callaghan of Burlington, a priest of the Diocese of Ireland. The congregation consisted entirely of two families, the McCaughin family and the Quigley family. It was not until 13 years later, in 1844, that a church was built by Edward McCaughin at his own expense on his own land, and he named the church St. Mary’s. In 1852 Bishop M’CLoskey visited Ticonderoga and because the Bishop believed it was imperative that the parish should own its own church property, a new church was commissioned to be built in the area of our present rectory, and upon its completion, use of the McCaughin chapel was discontinued. 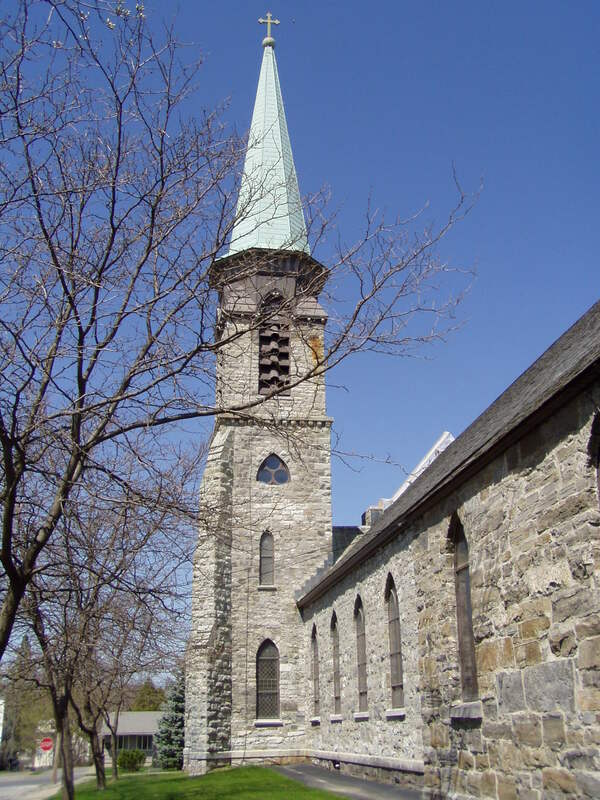 Priests from Port Henry served the Ti church until 1868, when Father Louis Des Roches was appointed St. Mary’s first resident pastor. Thereafter, pastors were assigned to our church on a regular basis. I do not refer to each of them as I found no event of historical significance until the arrival of Father Michael Hallahan. In 1887 Father Michael Hallahan was assigned as pastor of St. Mary’s and he served until 1891, a period of 4 years, when he died. He was 37 years old and he had been a priest for less than 9 years. He suffered from a terrible ailment of the kidneys called Bright’s disease. He was ill for practically the entire time he spent in Ticonderoga. Upon his arrival Father Hallahan found that the financial affairs of the church were not in good order. Upon his first appearance, the church was sued for nearly $2,000 for old debts against the church. He assured the creditors that he had come to stay and he promised them they would be paid in full. During the years following the arrival of its first resident pastor, Father Des Roches, the church was continuing to develop and the congregation was growing and new facilities were needed to meet the increasing need. In 1889, two years after his arrival, Father Hallahan laid the foundation of the church on this location. He organized the raising of funds for the cost of construction of the church, and he donated his yearly salary towards the liquidation of the debt of the church. For the period he was pastor, he oversaw and personally worked at the church. He not only directed the construction, but he was also instrumental in selecting the stone from a quarry and worked in the quarry on the McCaughin farm. When the church was finished, the first mass held in the church was Father Hallahan’s funeral mass and he lies buried just outside the front entrance to the church according to his own request, for as he said, the people going and coming from the church will be reminded of me and will pray for me. His grave was initially marked by a simple iron rail. In August 1993 the iron rail was removed and a marble stone was placed over the crypt with this inscription: “The church stands as his monument.” In 1896 the bell was installed in the steeple in honor of Father Hallahan. Words in Latin are inscribed on the bell which translated state: “All to the greater glory of God, Michael is my name, I call the people, I convene the clergy, I bemoan the burial, I grace the festival.” Father Hallahan was man of great strength and great form. He was a person gifted with a warm and pleasant personality demanding of great respect. It is hard to conceive how the structure was erected based on tools and equipment that was available during the period of 1889 to 1891. It is an amazing accomplishment over a two-year period. The church as a structure stands as a memorial to the dedicated service to those who were involved in its construction and of course Father Hallahan. The archive material pays tribute to Father Hallahan in this manner: “His zeal and devotion to the missionary work supported by his wonderful powers of endurance soon changed the state of church affairs in the region.” It was further noted that the splendid church makes St. Mary’s one of the finest churches in the diocese. The church was dedicated by Bishop Gabriels in 1892. Father O’Brien, who succeeded Father Hallahan, fully completed the church and built the rectory which now stands adjacent to our church. The next event as part of our archive history was the arrival of our pastor, Reverend Cyril Stevens, who became pastor in 1913, was a native of Belgium, was pastor for 45 years, who retired at the age of 88 from St. Mary’s in 1958 and returned to Belgium for his final stay. In 1942 a fire occurred, damaging the interior of the church and causing $100,000 in damages and nearly destroyed the building. The cause of the fire is unknown. What follows is the history based on my recollection of St. Mary’s, assisted by my wife, Rose Marie, and my children and some events based on my personal knowledge. I arrived in Ticonderoga to establish a law practice on April 1, 1950. I planned on staying. In a 1937 Chevrolet, filled with dishes in the rear seat, I managed to navigate my way down Tongue Mountain. My first stop when I came into town was to drive to the rectory to call on our parish priest. As I told you, Father Stevens was pastor until 1958. But it was Father Francis Ruddy, the assistant, who opened the door and invited me in. We had a nice chat. Father Ruddy encouraged me to come to Ticonderoga and I was leaving, Father Stevens who had overheard our conversation from the top of the stairs had another view of my possible success and suggested that I might consider going elsewhere. Father Ruddy walked outside the door, stood on the steps to renew his encouragement, a discussion I remember to this day as if it were yesterday. I came to know Father Ruddy and considered him a personal friend. The man was a saint. He personally did anything and everything that had to be done around the church. The last time I saw anyone shovel snow from the roof of the rectory, it was Father Ruddy. Father Ruddy had one fault. He would end his initial homily with the phrase, “and so.” Once he said “and so”, he went into a completely new and additional homily, sometimes you would hear three or four homilies, independent of each other, at one Mass. He could deliver a homily that would be more appropriate for Easter or Christmas in July or August. It was hard to make plans to do anything when mass was over for you could never time the end of the Mass. Father Ruddy was with us from 1937 to 1956. When he left, the Knights of Columbus decided that we would raise money to buy him a car. He never had an automobile while he was the assistant. A group of us went down and spoke to Charlie Moore, who had a Chevrolet agency. No sooner did we mention to Charlie that we wanted to buy a car for Father Ruddy, he snapped back and said I will give you the car at my cost. The cost was $2,300. Now bear in mind in 1956 cars did not come equipped with many of the items that are standard equipment today. A radio in the car was an extra. As we talked to Charlie Moore, not only did he give us the car at cost, he threw in a radio at no additional cost. Father Ruddy left Ticonderoga to go to his new assignment, which was St. Rita’s in Deferiet, driving a 1956 fully equipped green Chevrolet sedan. Father Stevens will tell you that he came to the Ogdensberg diocese, being one of five priests from Belgium, at the invitation of Bishop Gabriels, who also was from Belgium. The arrangement was that each year they would be entitled to return to Belgium for a visit. Each year at some point, Father Stevens would give a homily speaking from the pulpit, and his closing remarks always ended, “Goodbye America.” As long as he was able, he returned to Ticonderoga. Following the announcement he would personally take up the collection. The money from those collections was to be used to cover his expense to travel to Belgium and return. It was a time when the phrase “be as generous as you can” took on a special meaning. The collections were always a success. Father Stevens was pleased to tell you that during the depression, he was put in charge of our local bank. In those days, banks were considered a poor risk and they needed a person with credibility to encourage depositors. Father Stevens served as the head of the bank for nearly one year. Each day he sat in the main office of the bank and made his presence known. When Bishop Gabriels learned of Father Stevens’ interest in banking, the Bishop terminated his banking career and directed his work to his priestly duties. In 1958 Father Edward Pierce became pastor and remained until 1970, and sometime during his day he was elevated to monsignor. It was during Father Pierce’s stay that St. Mary’s school was built. In 1958 Bishop Navagh made it his priority to establish a school in each parish that in his judgment could afford a school. Committees were formed from parish members, solicitations were conducted and contributions were made. The school construction cost was in the area of $237,000. The school opened in September 1959 with four grades, 1 through 4. All grades were attended to by the sisters of St. Joseph from Watertown. At opening, our family had a 1st grader, 3rd grader, and a 4th grader. In time, each of our seven children would graduate from St. Mary’s. Each of them to this day will tell you they received an excellent education at St. Mary’s. My children’s memories of St. Mary’s was that the school was immaculately maintained. Food in the cafeteria was great. Wednesday was a special day as food was prepared from scratch and dessert was a brownie for all and eighth graders were entitled to two brownies. When Father Donald Sequin became a member of the faculty, who taught 7th and 8th grades and who was pastor at Sacred Heart Church in Crown Point, he was served a tray of brownies to return what he didn’t eat. On some occasions, I was told the tray was returned empty. The school was a success from its beginning and continues to be a success to this day. From their start at St. Mary’s, two of our children are doctors and one is a lawyer and one is a teacher of students with learning disabilities. All are college graduates. Two of them annually participate in the school’s adopt a student program. Graduates who attended St. Mary’s are often found at the top of their class upon graduating from public high schools. The school has been fortunate to have parishioners work in the school, cooking and serving meals, attending to the library as volunteers from its inception to the present time. Time does not allow to recite the names of all of them. Also I presently refrain from any attempt to name them. Failing to name anyone whose dedicated service I fail to recognize, being they living or dead, would be inexcusable. I am sure the living will understand. The interior of the church was destroyed again by fire in August 1959. The repair of the damage cost $175,000. The cause has never been determined. It was a timely fire in that mass was held in St. Mary’s school gym. The church was reopened for midnight mass Christmas 1959. From 1939 to 1959, some 22 Franciscan sisters of the Atonement served our parish, teaching catechism, preparing children for communion and confirmation. Since our school opened in 1959, 61 teachers of the Sisters of St. Joseph have taught in our school. We hang onto the last of them, Sister Sharon Dalton. We are concerned when the time comes that she decides to retire, how we will find five people to replace her. No one can leave this position without some reference to her work as part of the history of this church. Sister Sharon has been the principal of our school for the past 22 years. She has worked diligently, dedicated to keeping our school first in education and further to render it financially sound. Recently, I purchased some dark chocolate candy bars from her and I asked her if she had any more. She responded, “How many would you like? I have 15,000 more.” Such a person is best described as being irreplaceable. Following Father Pierce, our pastor was Monsignor Dwyer, who arrived in 1970. A pleasant man, very quiet, good sense of humor. I remember Monsignor Dwyer on the occasion of the church council debated whether or not to have bingo. We debated for two hours. Finally the resolution was put to a vote. It carried by one vote. No sooner was it announced that the motion carried, that Monsignor Dwyer announced bingo equipment would arrive Monday. He had ordered the equipment ahead of time. Monsignor Dwyer said Mass daily until his final illness. Father Wright, who succeeded Father Salmon, was with us for 4 years. He became ill during his stay with us, which hampered his work. Here again was a pleasant, kind man who was loved and respected by our parishioners. In 1991 Father Alan Shnob, always referred to as Father Alan, was pastor until the arrival of our present pastor, Father Bill. Father Alan continues to have an excellent relationship with many of our parishioners who still call on him from time to time. Father Alan was a mechanic at heart who could see a problem for a carpenter, plumber or electrician at a glance. Many times he would repair what was in need of repair himself without calling for anyone’s assistance. This brings us to our present pastor, Father Bill, who has been with us since May 1996, and whom we have come to know, love and admire, find him to be pleasant company, who has seen to it that we have a rejuvenated church with a sound system that allows each to hear every spoken word from the pulpit. I have been most fortunate to play golf with Father on Saturdays except for those Saturdays that he has either a wedding or a funeral. On behalf of all of us, I am asking Father to remain at St. Mary’s for as long as God continues to bless him with good health. Through the years during my time our church has been blessed with the volunteer services of many of our talented people whose services got the job done without cost to our parish. Recently a dedicated group replaced the kneelers of the entire church. From time to time parishioners have tended to needed repairs of the school. Here again, it would be risky to try to name them all for fear of missing one. I am sure that they will understand. Finally, we should all rejoice that we are a warm and friendly parish. In good times and bad times we hang together. In times of tragedy we are supportive of the ones injured. In good times we pray, laugh and play together and thoroughly enjoy each other’s company. Collectively, we have made great strides in meeting the increasing financial needs of our parish and there is no evidence that any of this will change anytime soon. Finally, and so…., this concludes my remarks setting forth the history of St. Mary’s.